Does the 2007 report by the United Nations' Intergovernmental Panel on Climate Change (IPCC) meet its own standards? Is there a discrepancy between what we've been told and reality? Has the IPCC chairman misled us? Have news reports misinformed us? There are compelling reasons to suspect that this is the case. We, the public, have been advised repeatedly that when the IPCC writes its reports it relies solely on peer-reviewed scientific literature. But an examination of two random chapters has revealed that as few as 25 percent of the listed references were peer-reviewed. NOconsensus.org has called for volunteers to assist in examining the remainder of this mammoth report, which is often referred to as the climate bible. The goal is for the findings of this crowdsourcing project to be published on this page in early April 2010. 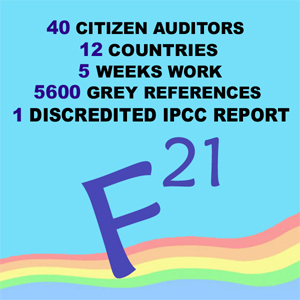 The individuals listed below are part of the team currently conducting a citizen's audit of all 44 IPCC chapters. >> Who's concerned about the climate report?